Patrick Mc Laughlin is a qualified Physical and Manipulative therapist since 2000, through the Northern Institute of Massage, Bury, England, and the Northern Ireland Institute of Massage in Derry, Ireland, and is registered with the Irish Institute of Physical Therapists. Not only holding 14 years of experience in treating and rehabilitating injuries, Patrick is also a qualified Fitness Instructor and Pilates instructor with over 6 years’ experience, and is currently studying a BA Degree in Strength and Conditioning, so is well qualified in giving advice on injury prevention as well as treating injuries! 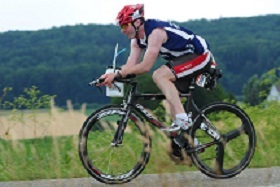 Patrick is also a qualified coach and tutors coaching for Triathlon Ireland, and is a certified bike fitter through Bikefit®. As an active athlete himself, Patrick has played a wide range of sports including rugby, karate, kickboxing, weight training, running and triathlon, and has competed for his country in both karate and triathlon.